MDOT is requesting $882,000 for the implementation of “Charm City Bikeshare.” 44 stations and 425 bicycles are envisioned. Great news! However, it takes two to tango, and Baltimore will still need better bicycle infrastructure to create a beautiful dance in Charm City. Baltimore has made strides, but Bicycle Magazine is probably on target ranking Charm City 48th out of its top 50 US bicycling cities. Baltimore falls right behind Fargo, North Dakota and Anchorage, Alaska on the list. To leap ahead of our frost covered competition, Baltimore should build a bike friendly infrastructure network, focusing on its destination rich center to complement Bikeshare. Envision a resident or a visitor starting their Charm City Bikeshare experience in Inner Harbor East. “Sharing” a bike to reach the Convention Center, Camden Yards, University of Maryland Baltimore/Hippodrome, or Penn Station, are all indirect awkward bicycle trips. However, these are the kind of bread and butter trips that make for a successful Bikeshare system. Cycle tracks covering the above territory would provide a core network while giving future Bikeshare users the desired infrastructure in the heavy traffic places that should matter the most. The costs would not be inconsequential, but pale in comparison with other transport infrastructure. It is not a whole lot more than barrier curbs and paint. Other cities are creatively funding these types of projects using local and federal dollars. 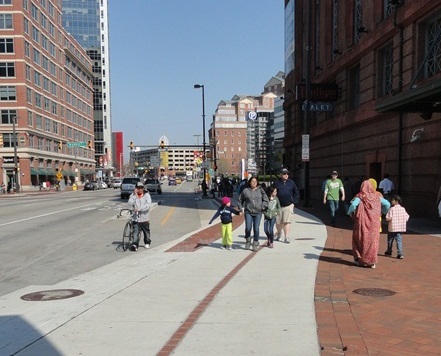 The quality of Bike friendly infrastructure on Pratt Street is a telling barometer of how serious the city is about making bicycling a serious transportation option. 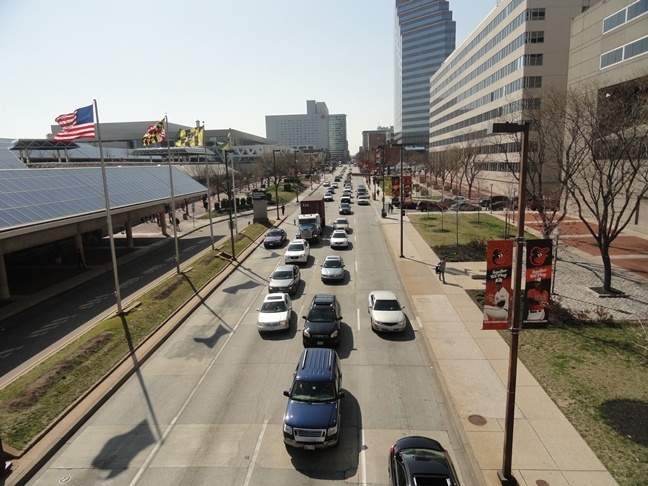 Pratt Street is home to more square footage of office, retail, restaurants, and visitor attractions than any other 1.5 mile stretch in the region. It is arguably Baltimore’s premier main street. This corridor is plenty-wide to incorporate a generous (bicycle only) bi-directional cycle track. A city that has a Complete Streets Law and looking to advance its Bike friendly bronze rating should prioritize its priority streets for bike infrastructure. 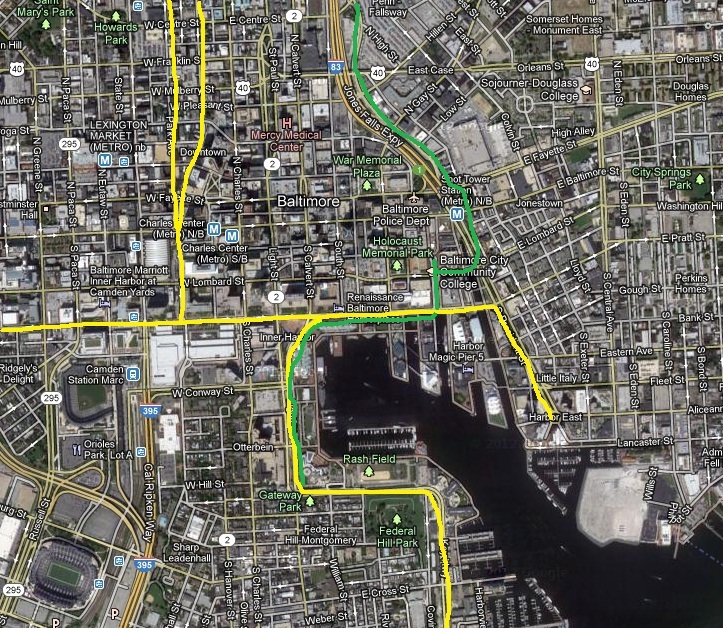 The JFT only traverses four of the roughly 18 blocks between MLK and Inner Harbor East. The JFT doesn’t connect the stadiums, UMB, the convention center, Inner Harbor East, etc. The JFT is a confluence of slow-moving humanity. On nice days, the trail is packed with moms, strollers, children, sports fans, tourists…. It is the ultimate bike/ped conflict hazard zone. In places with this many people, bicyclists need a bike only cycle track. Too many people crowd the Jones Falls Trail to be bike friendly-notice bicyclist walking astride bike. Last summer, I had the opportunity to visit Montreal and use the Bixi Bikeshare and their route verte system for almost every trip we made within the city. Bixi worked so well that sometimes it was hard to find a bike because so many were in use. 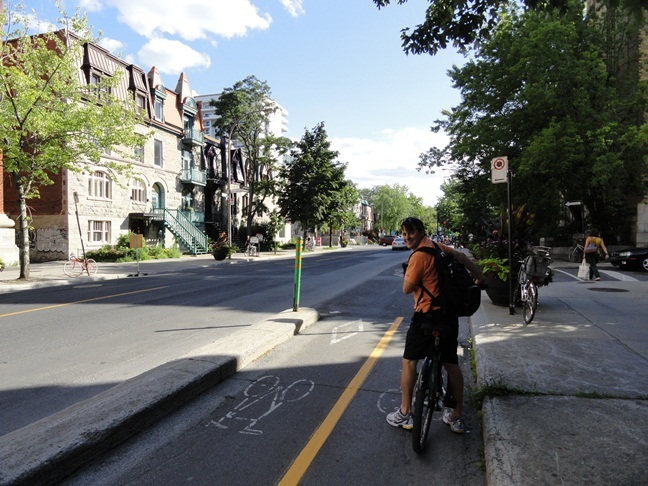 Montreal has built cycle tracks all over the city and they function as a real transportation network serving all generations. Baltimore should be applauded for pursuing bike share. Baltimore is an ideal bicycling city with clustered destinations and neighborhoods like pearls on a string. However, to meet its potential, an efficient cycle track network starting in the core of the city should be implemented. Bikeshare is not unlike; roads, the internet, sewers, subways, and cell phones. The network is just as important as the bikes and it does not work well when clogged, indirect, or disconnected. What do you think Baltimore needs to be a Bikeshare success story? Biking downtown is most definitely a treacherous activity not fit for the meek or inexperienced. I agree that few residents and virtually no visitors will use bikeshare if they don’t have infrastructure that makes them feel safe. What kind of political will do you think there is for these types of projects? Yes, Baltimore’s core streets are going to need to be adapted for bicycles if bikeshare is going to reach its potential. Baltimore is going through some personnel changes at DOT. Hopefully, the new blood in DOT will have it in their DNA to be bike friendly or see the bike friendly transformations in NYC, Chicago, DC, etc. and realize this can and should be done in Bmore too. Bike infrastructure improvements will come, but we need to push to make them happen more quickly, in prime real estate locations, and be well designed. The cycletrack on Maryland/Cathedral is planned and coming. DOT and advocates are also aware of the issues with the JFT and are working to make improvements. Perhaps green paint and better enforcement of the Bus/Bike only lane on Pratt would further help. Glad to hear MD/cathedral cycletrack is coming! Do you know when? Looking forward to it when it is constructed. JFT improvements will help, but the JFT doesn’t reach far enough east and west even if right of away fixes are on the way. 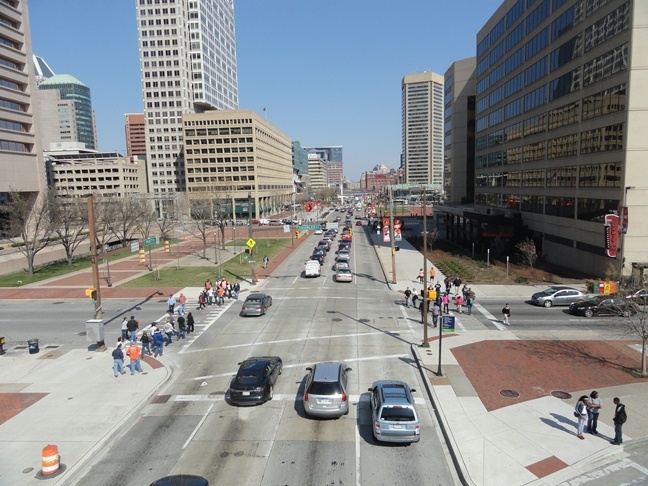 A generous bi-directional cycletrack is needed from Inner Harbor East to MLK. there is plenty of room to make it happen if it became a priority. 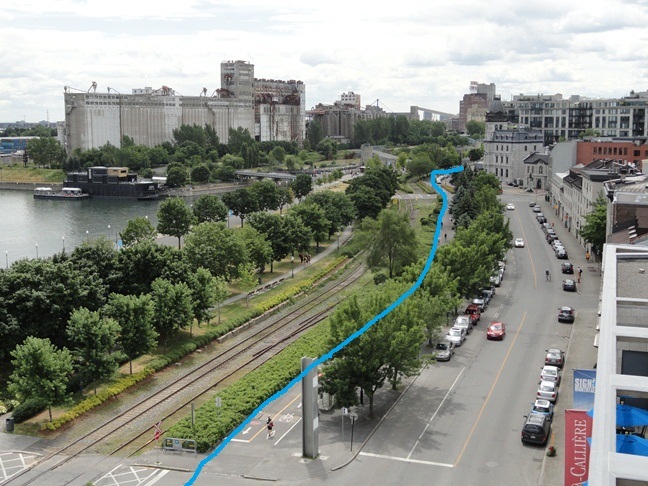 Key highway is also wide enough to easily accommodate a cycletrack. Do you agree? Also consider the MLK Trail, converting one or both of the underused wide sidewalks along MLK Jr Blvd to multi-purpose trail from Camden Yards to Penn Station, which, along with the aforementioned cycletrack or trail along the full length of Pratt would make a ‘bike beltway’ around downtown. The city had plans for this trail at one point, but dropped them when the funding didn’t come through. Any facility through the Inner Harbor will be clogged, requiring low speed and extra care, because of all the tourists, who seem unable or unwilling to read signs or use their eyes and/or brains. It’s how they walk (and drive) in any tourist-heavy area. The underused wide MLK sidewalks certainly could have cycle tracks. I think the first priority cycle tracks should go through the destination rich downtown (not around) so the cycle tracks (bikeshare) directly reach the most jobs, retail, restaurants, entertainment, residences, etc. A bicycle only cycle track on Pratt separate from sidewalks and the JFT would greatly reduce the clogging. A few bollards and chains could reinforce the separation of the cycle track from the sidewalk pedestrians, if necessary. I used the bike share program in Chicago with wonderful success! There was painted lanes in the road in some places for the bikes but otherwise it was up to you to follow traffic and traffic laws. I plan to visit Baltimore late summer and have been hoping there would be a bike share program in place by then. Best way to see a city I think!